Most small-scale producers utilize natural ventilation during warm weather. As the weather cools, regulating the environment inside livestock and poultry buildings becomes more difficult with manually operated vent doors. 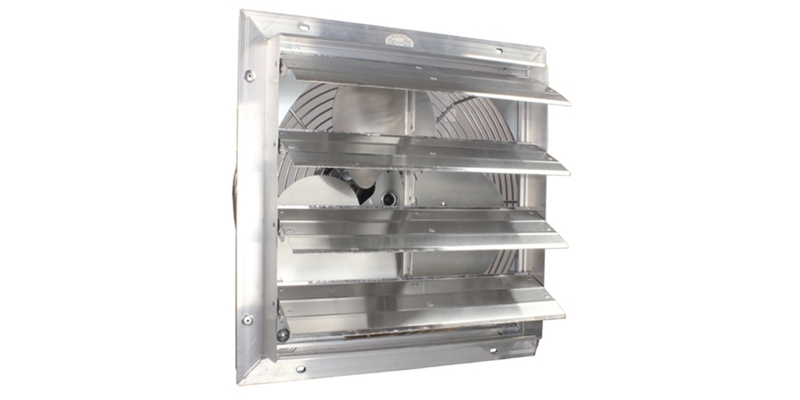 Adding a small ventilation fan(s) simplifies the task of maintaining a healthy environment for the animals. The first step is to determine the minimum and mild winter rates for the amount of the animals housed. Table 1 displays a chart with recommended ventilation rates taken from an older university manual. Minimum rates are the recommended ventilation in cfm (cubic feet per minute) needed to control moisture and prevent condensation from forming on interior surfaces. The additional mild winter airflow stops rising temperatures inside the building as the outside temperature increases. For our example, we'll use a 24' x 30' farrowing house with ten crates. As a fan operates, it creates a static pressure difference between the inside and outside of the building measured in water column inches. Pick an exhausted fan for this application according to its stated cfm deliveries at .05" static pressure. 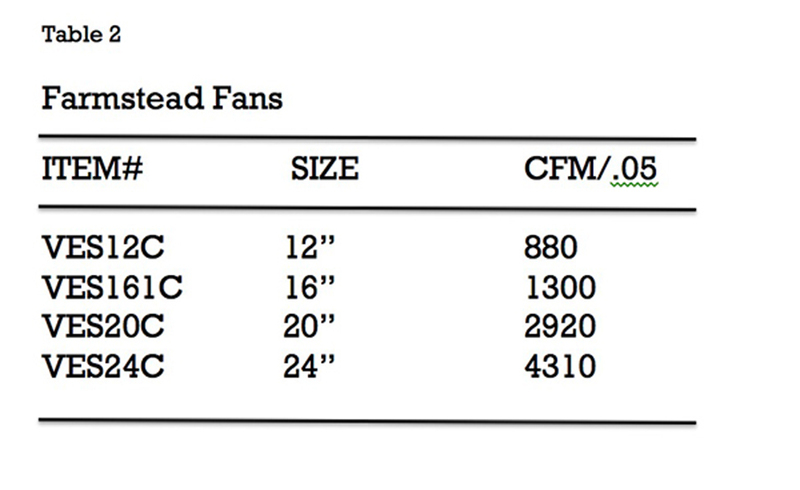 From the list of fans shown in Table 2, the 12" fan is rated at 880 cfms. This cfm rating matches up closely with the mild winter rate in our example. We have two options that will enable us to reduce the cfm delivery down to the minimum rate of 200 cfm. We can use an inexpensive variable speed controller to slow the speed of the fan. (see variable speed control #NE105F) But be aware that a reduction in fan speed does not directly mean the same reduction in cfms. In other words, reducing the fan speed by 50% does not reduce air delivery by 50%. Turning a fan down too slow can also cause the motor to overheat. A more accurate method of reducing the amount of air exhausted is using a 5-minute cycle timer. In the example above we would set the on cycle for one minute and off cycle for four minutes. The additional advantage of using a timer is it allows more flexibility for changing animal density. For instance, if our example farrowing barn was half full we could reduce the on cycle to one minute. If we chose to wean the pigs in the crates and leave them there until they weigh 40 lbs., we would be able to increase the on time to two minutes. Either the speed control or timer can be wired in parallel with a single stage thermostat to override the low setting. As the temperature rises inside the building, the thermostat takes over and runs the fan at full speed. If the inside temperature goes down with the fan running on high, the thermostat drops out, the timer takes over, and the building returns to minimum ventilation. Operating the minimum ventilation during cold weather will mean adding supplemental heat to maintain a comfortable temperature for the animals. Turning the fan down to prevent the heater from running will create damp, smelly air inside the barn. Table 3 lists the likely supplemental heat requirements per animal. These rates assume adequate insulation in the walls and ceiling and minimum to no air leaks. 100 nursery pigs x 350 = 35,000 Btu heater. You will also need to provide air intakes matched to the total ventilation capacity of the fans. A simple gravity activated sidewall inlet (see #HS1200) is the best choice for most situations. Inexpensive and easy to install, this simple plastic inlet automatically opens allowing airflow when the fan(s) operate. When the timer shuts the fan off, the plastic louver closes. 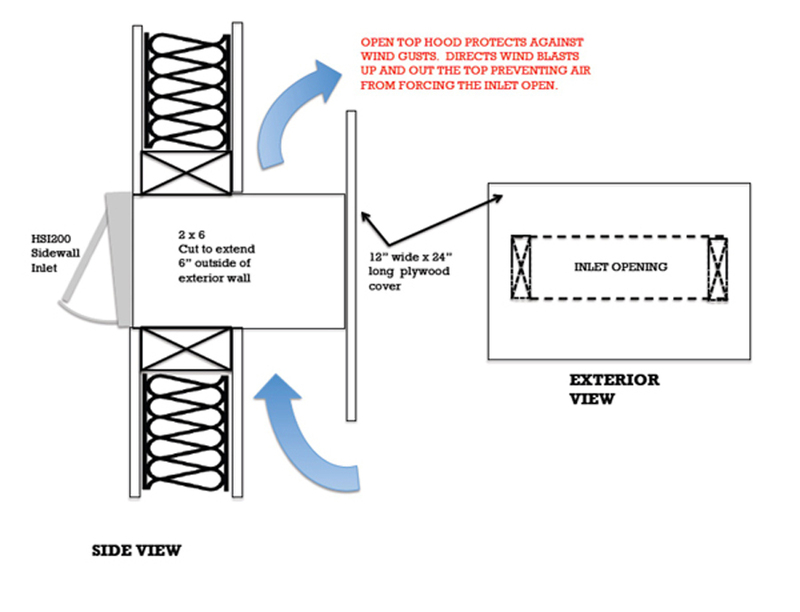 Inlets installed in an outside wall require a hood to protect strong winds from forcing the louver open. See Inlet Hood diagram. Inlets are typically located opposite the fan(s) to pull air across the building. 880 cfm/ 430 = 2.04 or 2 inlets needed. We provided this short article as a guide to adding wintertime ventilation to an existing building. Your individual building will vary by location, the condition of the structure and other factors. For a detailed calculation of the ventilation equipment needed for a particular building, please contact us at web.info@hogslat.com.